2017 was a good year for the global economy. Unemployment fell while the consumer price index rose and international trade grew. According to the International Monetary Fund’s latest report in October 2017, global economic output grew by an estimated 3.6 percent in 2017 and it is expected to grow by 3.7 percent in 2018. Though the outlook has improved, uncertainties and systemic problems create doubt about the prospects of recovery, such as asset bubbles, high levels of global debt, anti-globalization sentiment, US policy adjustments, Brexit and regional geopolitical conflicts. At present, the global economy is enjoying broad, synchronized growth beyond what anyone expected, with rising demand and commodity prices. However, if we deduct the price factor, the actual export volume of goods is not that high. In the first two quarters of 2017, global exports in goods increased by 4.4 percent and 3.5 percent, marking a slight year-on-year increase of 3.8 and 1.0 percentage points, respectively. In terms of trade liberalization, the World Trade Organization announced in early 2017 that the Trade Facilitation Agreement (TFA) has entered into force, having surpassed the minimum requirement of 110 ratifications from members. However, at the same time, the United States announced its withdrawal from the Trans-Pacific Partnership Agreement (TPP). Also, negotiations have stalled on the Transatlantic Trade and Investment Partnership between the United States and the European Union (TTIP) and the US-China Bilateral Investment Treaty (BIT). Trade protectionism has intensified globally. India, Vietnam and Eastern Europe have been incorporated into the global production network, but significant changes have yet to occur in the global value chain. Therefore, the basis for active international trade is not quite stable. 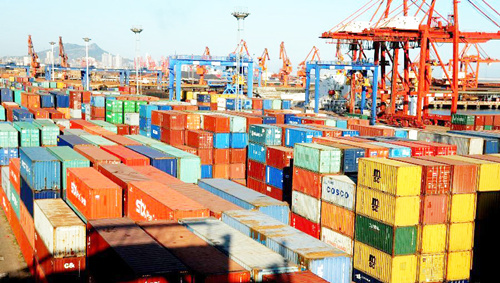 It is expected that the future growth rate of global exports in goods will be between 5 to 10 percent, with real exports of goods growing at a rate of around 5 percent. The future of US fiscal and monetary policy will be dominated by two major factors: Trump’s fiscal plan and increasing the benchmark federal funds rate while shrinking its bloated balance sheet. Both policies will have a greater impact on the world economy. Trump’s fiscal plan has three key elements—tax cuts, lower government spending, and increased defense and infrastructure investments. Tax cuts are intended to boost US economic vitality, while the goal of reduced government spending is to balance the budget and make up for the anticipated fiscal deficit created by the tax cuts. Increased defense and infrastructure investments are designed to improve security and fulfill the promise of a greater America. In the 1980s, US President Ronald Reagan implemented similar policies, which had some effect on economic growth, but did little to balance the budget or curb government debt. Therefore, it is possible that Trump’s policies will lead to a modest increase in GDP growth but a large fiscal deficit and an increase in government debt. On the one hand, US GDP growth will have positive spillover effects on the world economy. On the other hand, the fiscal deficit and mounting government debt will put upward pressure on interest rates, attract foreign capital inflows to the United States and cause the dollar to appreciate, which eventually may bring economic turmoil to the rest of the world. The Federal Reserve lifted its benchmark short-term interest rate in late December for the third time in the year of 2017. In fact, the central bank has raised rates five times since 2015. Fed officials have also penciled in three more rate increases in 2018. We should expect that economic conditions will allow the other major central banks—especially the European Central Bank (ECB)—to follow suit. In the short term, the rate hike will have limited influence on Asian financial markets, but in the long term, higher US interest rates portend an ongoing tightening of global liquidity conditions. As they unwind massive holdings of assets purchased during quantitative easing programs, balance sheet normalization by the Fed and the ECB will further tighten global liquidity, as will ongoing deleveraging in many economies. At root, the wave of anti-globalization is caused by the economic imbalance and internal inequality of the major economies in the world. The widening income gap has become an increasingly serious problem in developed economies and an intrinsic motivation for them to adjust globalization policies. In practice, there are three main reasons for such income inequality. One is that it is an inevitable result when the rate of return on capital is greater than that of economic growth. As the share of capital gains in the national income grows, wealth becomes increasingly concentrated in the hands of a small number of people, and the huge inequality of wealth intensifies income inequality. Second, technological progress benefits the middle class and high-income groups in developed economies but not the lower classes. Finally, globalization brings inequality due to the malfunctioning compensation mechanisms for those who suffer from globalization. There are mainly two kinds of compensation mechanisms: one is that the losers are automatically transferred to the winners’ sectors, and the other is to share gains directly with the losers. Neither mechanism has worked well in developed economies, such as Europe and the United States. That said, developed economies will be unable to reduce inequalities by adopting anti-globalization trade protection measures instead of addressing the concentration of wealth, the effects of technological progress and failing compensatory mechanisms. Unfortunately, domestic measures that can effectively reduce inequality often involve major interest adjustments in Western countries and thus are difficult to implement. In reality, the anti-globalization measures promoted by Western politicians as means to pander to domestic voters are in fact quite precarious for the future of globalization and the world economy. The growth of debt levels and leverage varies among sectors in different nations. Developed economies are haunted by high levels of government debt while emerging economies find themselves mired in household and corporate debt. Though major developed economies have set up some fiscal rules for government debt, such as the US debt ceiling and the EU’s maximum limit for government deficit and debt, they have failed to stop their debt rise. In these circumstances, the only effective means to reduce debt is rapid economic growth plus a certain degree of inflation. However, too much debt will hamper growth. Without the healthy growth of the real economy, the expansion of government debt would either result in debt monetization and high inflation, or defaults. Both will lead to an economic recession. For emerging economies, the danger of rising corporate and household debt is looming. The ratio of non-financial corporate debt to GDP in emerging economies reached 103.6 percent in the first quarter of 2017, surpassing the average rate in advanced economies by 16.2 percentage points. While high levels of non-financial corporate debt is the result of inadequate financing channels, it also demonstrates that the economic rebound in emerging economies relies on credit stimulation to a large extent. Therefore, the deleveraging of non-financial corporate sectors in the future will somewhat come at the cost of emerging markets’ economic vitality. The ratio of household debt to GDP in emerging economies rose rapidly to 37.1 percent in the first quarter of 2017, though it was still far lower than the 73.8 percent seen in advanced economies. It was up 2.8 percentage points from the first quarter of 2016 and 6.8 percentage points from the same period of 2015. As a result, there is robust demand for foreign capital in emerging markets. This imbalance in savings and investment resulting from excessive domestic consumption and global payment imbalances is indeed dangerous for emerging economies. Inadequate domestic savings will slow down capital accumulation and undermine long-term economic growth. Global payment imbalances tend to trigger a currency crisis, which can lead to a build-up of external debt, even a foreign debt crisis. Low interest rates and loose monetary policies in advanced economies have fueled asset prices. In the United States, real estate prices are almost as high as they were before subprime crisis. Similarly, asset prices continue to rise rapidly in other developed economies, such as Europe and Japan. At the same time, stock and real estate prices in emerging economies are also rising rapidly due to the large amount of capital inflows that resulted from the depreciation of the dollar in 2017. It can be seen that the current asset bubbles have become a huge potential threat to the stability of the world economy. The longer asset prices rise, the greater the damage when the bubbles burst. In a nutshell, the global economy is projected to carry forward its current momentum in 2018, but dangers for the recovery lurk on the horizon. Yao Zhizhong is deputy director of the Institute of World Economics and Politics at the Chinese Academy of Social Sciences.